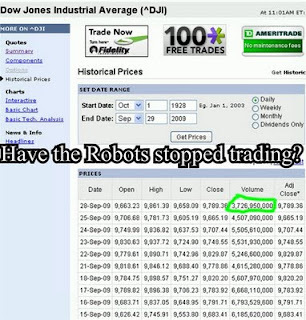 Sub Epic Mis-Adventures: Is SKYNET down on Wallstreet? Tyler Durden from zerohedge.com had an article yesterday about how stocks are still high even though there is almost no volume. I decided to check out the volume for the Dow Jones yesterday just to see. Perhaps Skynet is rebooting.